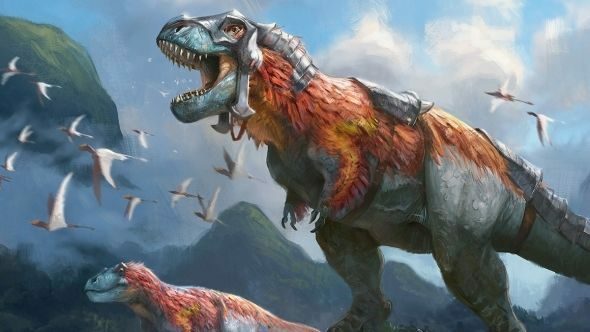 MTG Arena card release times will, eventually, be simultaneous with paper releases. The problem is ‘authentic’ Magic was never designed to work like that. It is a game of responses and counter-responses, attack phases and rigidly defined times during which you can and cannot commit actions. It is an analogue game that, when pushed into the digital world, has either turned out like the massively awkward Magic Online or the dumbed down Duels of the Planeswalkers, missing important subtleties that take the paper game from good to masterpiece. This comes as a two-fold issue: first, Duels of the Planeswalkers showcases a prettier version of Magic, but it never flowed as well as Hearthstone. “My background before coming here was in MMOs and then in MOBAs and I’m really big on snappiness. In a MOBA, sometimes you’re resolving a skill in 300 milliseconds so, with all of the animation and the effects, my primary focus there is for them to do their job and then get out of the way.” Simply put, in Duels, animations take too long. Second, Wizards want every current card, and every future one while the game exists, to work within the system – no cutting mechanics that do not play nice, no fudging interactions. To do so, they have built a game rules engine [GRE], the “perfect Magic judge” as Clay calls it, which they are teaching Magic so it can teach you. “The hardest thing about working with the GRE is it’s very exacting. 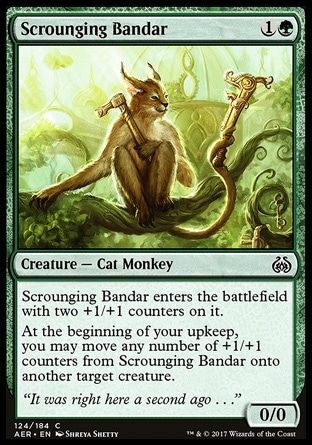 A card I like to point out is the Scrounging Bandar. In digital play, every [turn] you have to pick a creature to target, you have to choose whether you’re going to transfer counters. Part of the whole concept of authentic Magic is looking to the tabletop experience and seeing just how people play cards like that. Making that change for one card would not be too challenging. But when you consider a full set of 250+ cards, with four new ones each year, and that Magic looks set to exist for another quarter of a century without breaking a sweat – you cannot simply code it once and forget about it. “Taking the time to address individual cards like that and building systems so we can do it quickly is a large part of the focus of what we’re trying to do,” Clay says. On a wider scale, development of the GRE that runs all of this is not just an MTG Arena problem. Clay calls it an “anchor project” with his team’s game being “one of the uses for the project.” They are laying groundwork for Magic digital products for the foreseeable future, which means always thinking ahead to the next card set. “It’s part of the challenge of what we’re doing and it’s part of the reason I love working on this project. I’m not working on the card file largely, it’s something that comes over [from the paper Magic development team] so each set is new and exciting for us too,” Clay tells us. “From where we were when I started to today, the thing that is really exciting for me is how much just works with a new card file as it comes down, because so many of the systems we try to produce, we try to look at them very systemically, trying not to one-off if we can. Trying to solve the problem for the future as well. More and more often we’re testing cards for the first time and it just works and it’s fun to play around with right off the bat – which is good for our sustainability. 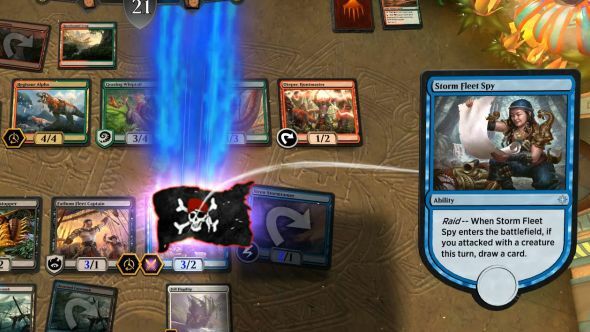 As gaming communities are wont to do, one of the immediate questions hanging over MTG Arena is if it can expand on its own as well as go backwards. 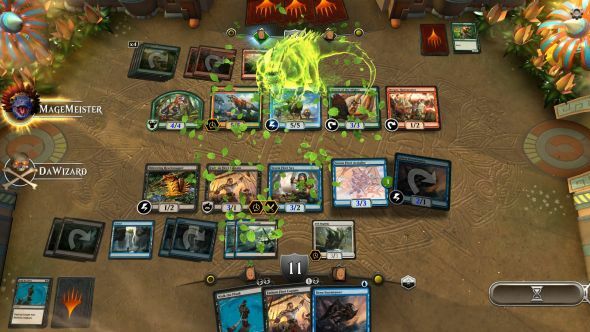 With 25 years of history and a dozen popular formats, Magic has a lot of available depth to explore – an advantage the one-to-one nature of Magic Online has over any other implementation. So, just how much of that history can the GRE handle? 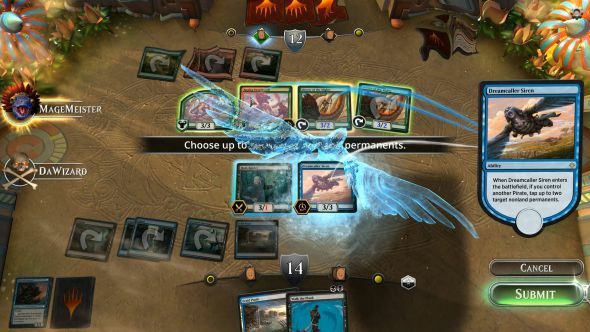 MTG Arena is due to enter beta soon. After a number of misfires over the years, and the lingering knowledge that they could have made the equivalent of Hearthstone if they had acted quicker, Wizards are looking to get it right. If they do, the digital version is just as likely to take over the world as the original.